The 2019 residential street sweeping program is now underway. Please watch for signs in your neighbourhood. Click here to view the most up-to-date street sweeping map. Residential street sweeping takes place between 8 a.m. and 4:30 p.m., Monday to Friday (not including statutory holidays). Each neighbourhood belongs to a sweeping zone, and the Roads Department operators will work their way through the zones until the entire city is complete. Alleys are not swept at the same time as the residential roads so that residents are able to park near their homes. Paved alley sweeping begins after the residential program is complete. At least 48 hours in advance, signs are placed at the entrances into the subdivisions scheduled to be swept. Watch for orange signs like the one pictured above as they will indicate when sweeping will actually occur in your area. If inclement weather doesn't allow for sweeping to begin or be completed on the dates posted, dates will be updated to reflect this. Find which zone your neighbourhood is in and the tentative start date by checking the Street Sweeping Map. Each neighbourhood will take approximately two days to sweep. The Street Sweeping Map will be updated, two zones at a time, daily. Street sweeping is more effective when all cars are removed from the street. Therefore, Public Works will institute the Tag & Tow Program in accordance with the Streets Bylaw. When the signs are up in your community, you may park in alleys between 8 a.m. and 4:30 p.m., but please don't block off emergency access, or access to driveways, garages and backyards. If you will be out of town for an extended period of time during April, May and June while residential sweeping is underway, we ask that you move your vehicle to off-street parking. Roads does not sweep private parking lots, so those living in townhouse or condo complexes do not need to move their vehicles if parked on-site. However, vehicles parked on the street must be moved. Spring clean-up is an annual program that removes winter sanding material and other debris accumulated during the winter months from roadways, sidewalks and boulevards. This prevents the material from entering the storm drains and helps keep city waterways, such as Nose Creek, cleaner. Divided into two phases, the program begins in late April and wraps up at the end of June. Residential street sweeping is split into zones based on neighbourhoods. The street sweeping map posted during street sweeping will indicate projected start dates and areas that have been completed. To keep our roads free of debris during the Summer and Fall months, sweepers may be seen on the arterial and collector roads. 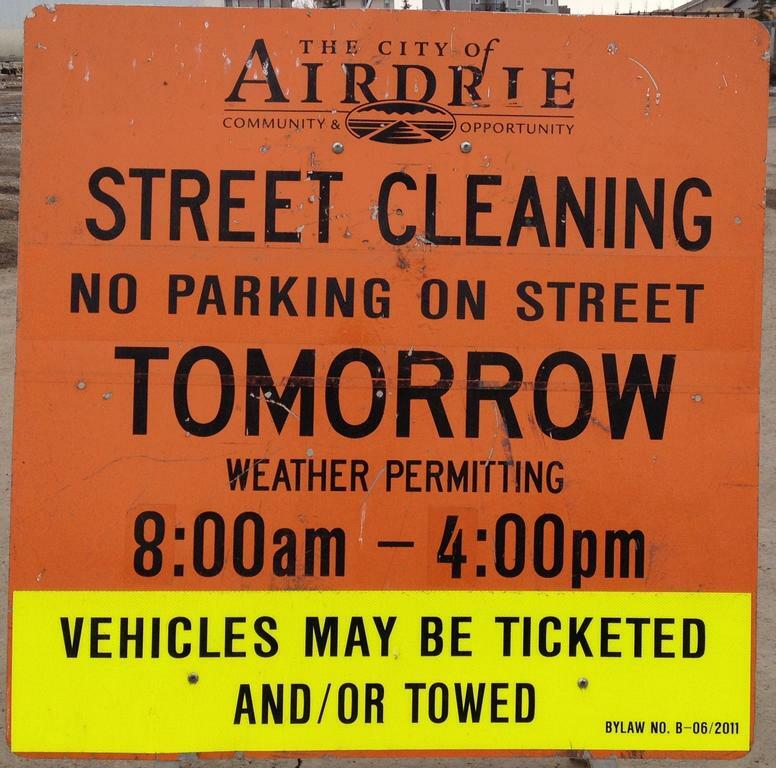 Clean streets contribute to the overall cleanliness of Airdrie, so your cooperation is appreciated. Street sweeping is a collaborative effort. We would like to thank the residents of Airdrie for moving their cars from City roads when sweeping is scheduled. What do I do if sweeping occurs on garbage/recycling pickup day? When will my neighbourhood be swept? I live in a new subdivision, why are my roads not getting swept? What if I’m going to be away the days that street sweeping is scheduled? What if I can’t move my vehicle? If my vehicle is towed, who do I contact? The sweepers have gone by, can I park on the street before 4:30pm?